This five candle pattern develops in a continuous uptrend. The first three days of the ladder top pattern are three long white candlesticks. 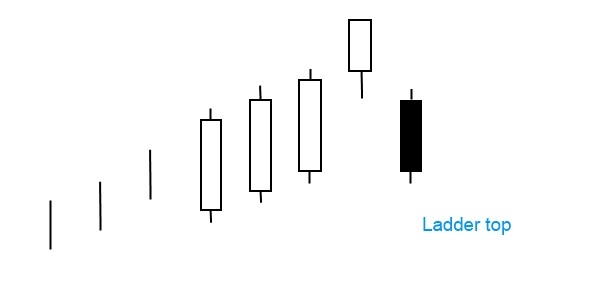 This section of the formation corresponds the three white soldiers candlestick pattern. The fourth day has a higher closing price. The long lower shadow shows that the stock price went well below the closing price during the day. On the fifth day a long black candlestick appears that opens below the body of the fourth day and closes poorly. The ladder top resembles the belt hold line pattern and finishes with a sharp selloff that marks the beginning of a new downtrend. It’s a strong bearish trend reversal pattern with moderate reliability.